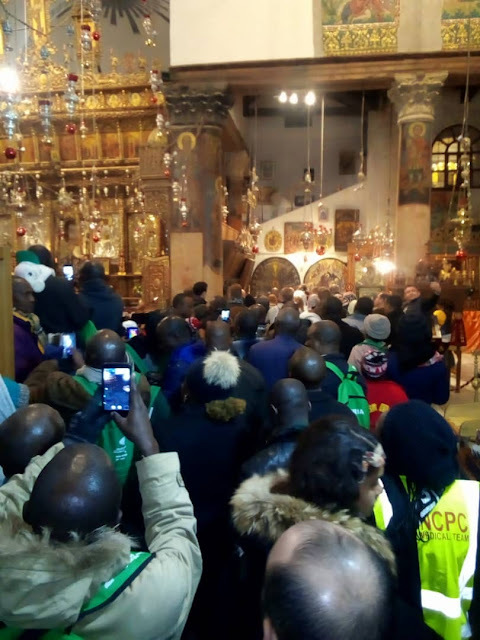 In continuation of the pilgrimage exercise, Pilgrims from Plateau State where in Bethlehem where they with a visit to the Basilica of the Nativity where they were opportune to kneel at the birth place of Jesus Christ in the Grotto of the Nativity. While in the city of Bethlehem, the Pilgrims were at the Fields of the Shepherds where the Angel of the Lord be occupied the birth of the Messiah. Prior to their visit to Bethlehem, the pilgrims converged on Olmalya where they held a prayer convocation which was attended by pilgrims from Nasarawa, Kaduna and Niger States. The prayer convocation was attended by government functionaries from Plateau and Nasarawa. The prayer convocation had in attendance traditional rulers from Nasarawa State, Government functionaries from Plateau and Nasarawa Statrd as well as Government functionaries including the Plateau Commissioner for Land Survey and Town Planning, Barrister Festus Fuanter.